The risk visualisation tool (RVT) has been developed to help customers identify where Settlement Risks commonly occur in the BSC processes. 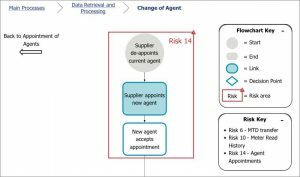 The diagrams should be used in conjunction with the Risk Evaluation Register (RER) to provide a guide to instances where Settlement Risks may occur in BSC processes. Send us your feedback as we will be adding more functionality and content to develop the tool further. Please refer to the BSC and subsidiary documents for full information about the BSC arrangements. The RER sets out the Settlement Risks that have been identified and evaluated by reference to types of Performance Assurance Party (PAP) e.g. Supplier, Data Collector or Unmetered Supplies Operator. The diagrams provide a simplified view of the compliant processes as outlined in the relevant BSC Section and BSCPs. Click on the process you want to follow and it will take you to the associated stages within that process. Use the breadcrumb to navigate back to earlier steps in the process diagram. When you reach a process diagram page it will show a start point and an end point, shown within a grey circle. 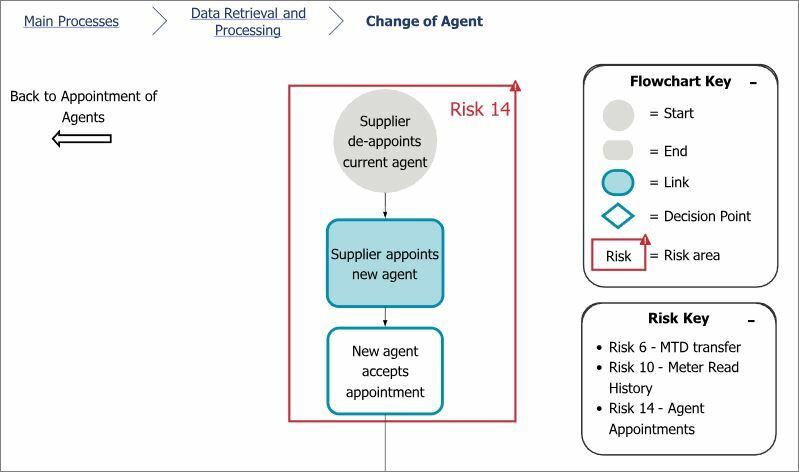 A red box with a risk number indicates areas where there is scope for these processes to go wrong, resulting in a material impact on Settlement. Further information about each risk is available in the Risk Evaluation Register. Please note that the tool can be expanded by clicking on the “Toggle fullscreen” option in the black footer bar. Please note that this content is best viewed on a desktop or tablet. These processes and risks may be subject to change. Any processes and risks will be updated in line with the Risk Register.